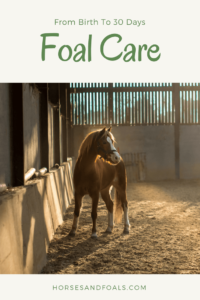 If your mare is expecting a foal, you are sure to be very excited and perhaps a bit worried about how to care for the new arrival. The good news is that if you have a healthy mare and a clean, spacious environment you won’t have to do much of anything. Your mare should be able to deliver and care for her baby just fine without much interference from you. Even so, it’s wise to be prepared for all possibilities. In this article, we provide general information about how to care for your new foal during the first month. Read on to learn more about foal care from birth to 30 days. 6 Do Foals Need Formula? As soon as your new foal takes his first breath he is signaled to transition from dependent fetus to independent foal. His legs will begin moving before he is fully delivered, and he should be able to stand up and nurse within an hour or so of birth. 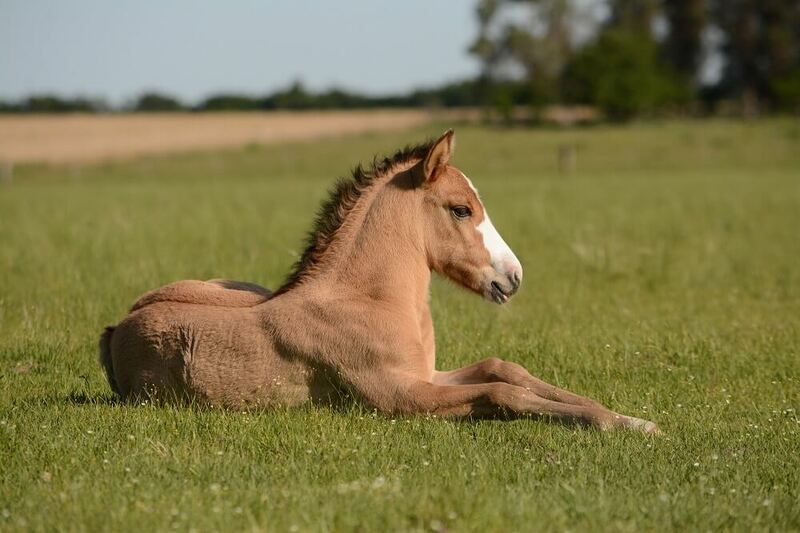 Most horse births go smoothly, and you may simply awaken one morning to find that you have a fine new foal in your barn or pasture. If you are present for the birth, you probably won’t have to do much of anything. Just monitor from outside the stall or several yards away in the pasture. Only step in if things seem to be going very wrong. When the foal is born, mom should be able to clean him up and get him ready to nurse. These first hours are a very important bonding time between mother and foal, and you should not interfere. 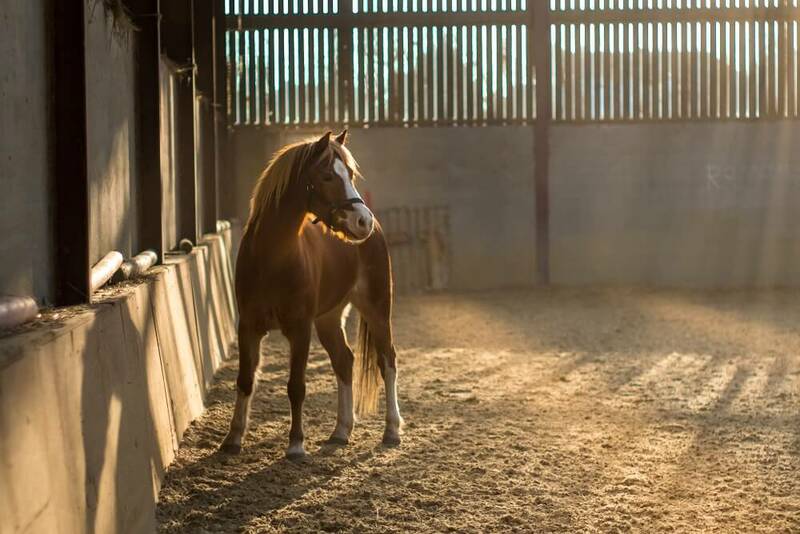 There’s plenty of time for your new foal to learn to interact with you, but establishing that basic mother and baby bond is an essential part of the foal learning to interact at all. After a couple of hours, there is one task you should perform. The umbilical stump should be disinfected with a mild solution of chlorhexidine or betadine and sterile water. The mixture should be four parts water to one part disinfectant. Put the mixture in a small, clean bowl and hold it under the foal’s belly to soak the stump. Pat the area dry with fresh, clean paper toweling. Monitor to be sure your new foal is nursing frequently and vigorously. It is very important that he take in colostrum from the mare’s milk right away. Her immunity against common maladies is transferred to the foal in this way. The day after your foal is born, your vet should visit to do a little blood work and examine your foal thoroughly. This early checkup gives your vet the opportunity to correct any abnormalities that might interfere with vital functions such as breathing and swallowing. Taking care of these things right away can prevent a wide variety of complications, failure to thrive and even death. Blood work will confirm that the foal has consumed enough colostrum to have good immunity. The vet will also check for limb deformity, eye and vision problems, heart problems, hernias and overall good development. If your vet notices any limb deformities in the initial exam, he or she is likely to take a wait-and-see approach unless the problem is severe. Many times, foals adjust and outgrow minor misalignments and deviations during the first month. Your vet will schedule a one-month exam. If problems are still present at the end of the month your vet may recommend a surgical procedure, exercise, therapeutic hoof care or some other remedy. At this time, your vet will make recommendations regarding vaccinations and parasite control. Be sure to follow your vet’s advice closely. In this video Dr. Rob Franklin provides valuable veterinary information pertinent to caring for your new foal during the first week. You should also have your farrier meet and evaluate your foal at one month of age. Scheduling trims will not be necessary until your baby reaches 6-8 months old, but it’s a good idea for the foal to get to know the farrier and to watch while mom has her feet attended to. Naturally, your mare and foal should live in a clean, safe enclosure with secure fencing. In open pasture, take care that pasture mates do not pester or bully the foal. If you live in a very hot or very cold climate, your foal’s growth may be hampered by extreme weather. In this case, be sure to provide mother and baby with good shelter from the elements. Having to deal with extreme cold or heat consumes a lot of calories and can cause failure to thrive or even death. In nature, foals are born in the springtime when the weather is mild and grazing is ample. Early life in a good pasture during mild weather surrounded by a natural equine social group is the best possible setting for optimum health and development for your foal. Living isolated, indoors or on a bare lot with a high percentage of grain in the diet is not desirable and may impair your foal’s growth and development. Within a couple of weeks your foal will begin nibbling at grass, hay and grain. Be sure to provide a high quality hay and nutrient rich feed to encourage good milk production in the mother and good growth in the foal. Talk with your vet to see if vitamin and mineral supplements are recommended. You’ll see big changes in your new arrival within a couple of days of delivery. In the days and weeks that follow, you’ll notice that your foal gets visibly heavier and taller every day. It is not unusual for foals to gain as much as three pounds daily when well-cared-for. If your foal is orphaned or if the mother does not produce enough milk, you will need to provide formula as demonstrated in this video. You should limit touching or handling the foal during the first few days, but do set up a good example by interacting positively with his mother. The foal will learn by doing and observing. He will naturally stay close to mom and take his cues from her regarding how to respond the rest of the world. Naturally, as you interact with the mare you can pet the foal lightly and speak with him pleasantly, but don’t go overboard with handling right away. Just getting used to your existence is enough learning and adjusting for your foal in the first few days. Horses are social animals and naturally form family groups in the wild. Research has shown that foals who grow up in a natural herd setting are more likely to develop normal social behaviors. This makes socialization with humans more natural and training easier. Early training for foals should simply consist of watching you interact positively with mom and other horses and being gently handled and petted. A young foal should not be exercised, nor should it be confined. Natural movement in an open setting is essential for proper growth and development. Your foal’s first month should be a happy time of play and learning about the world around him. This is a time for you to get to know your new arrival and make sure that he has a solid, healthy start in the world.